For those of you who happen to watch the childish movies or teen dramedies ABC Family is famous for, you know exactly what I'm talking about in the title. 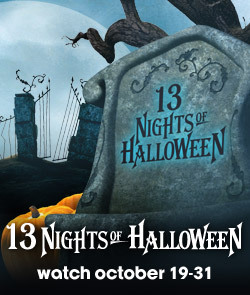 For those of you who don't, every year ABC Family runs a 13 day countdown to Halloween where they show a different Halloween themed movie. And because you all are now painfully aware of my love of Halloween, it's not too big of a surprise that I tune in anxiously every year for this countdown! So of course I've been waiting somewhat patiently for this to start and I am happy to say that tonight marks the first night!! In honor of this glorious time of year, I've decided to make one Halloween themed dinner for each night. They may not be the most inventive or intense recipes, but I can guarantee they'll be spooky! But first, a quick Wonton Wednesday post - Mini apple pies complete with lattice tops! I used a variation of this recipe I found and added the lattice tops and sprinkled with cinnamon sugar. This actually used up all of our wontons, so I guess Wonton Wednesday is dead until I can find another package of vegan wontons! Now, for the main event and to kick off the 13 Nights of Halloween - Tofu cutlet tombstones with smashed potatoes! I was inspired by a Halloween post I saw on Very Vegan Holiday. The cutlets are made from Vegan Dad's Crispy Tofu recipe and the gravy is just a quick Bisto mix. And of course no graveyard would be complete without some broccoli shrubs and a tofu cutlet coffin! What Halloween movie do you like to watch to get you in the mood?